A Ryanair passenger was arrested after opening a plane's emergency exit and climbing out onto the wing. The flight from London to Malaga, Spain had landed at AGP, but passengers had been waiting to disembark for around 30 minutes. That was too much for one pax, who decided to make an escape. The problem: where to go from there? 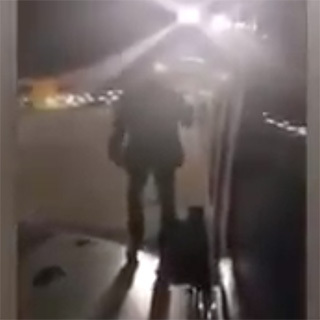 Footage of the incident, which has been shared thousands of times online, appears to show the 57-year-old man preparing to jump off the plane's wing with a bag in his hand. He was eventually talked out of jumping by ground staff and climbed back inside the plane, Malaga Hoy reported. The incident led to a further 40-minute delay for all those onboard. Fernando del Valle Villalobos, who captured the incident on camera, wrote on Facebook: "After leaving London an hour late to arrive in Malaga and be left in the plane for another 30 minutes (without any explanation from Ryanair)... this man decided not to wait any longer. He activated the emergency exit saying, 'I'm going via the wing'. Surreal!" The man was held by airport security before being arrested by local police. He now faces action from Spanish authorities.